Reduce stress in your life, and start to live from a deeper level of relaxation! This introductory Meditation Workshop teaches you the philosophy and basics of Mindfulness / Vipassana Meditation, and is preliminary to the Mindfulness Meditation Follow Up Course in Feb - Apr 2019. After 33 very successful workshops since November 2009, because of popular demand (and great results; read "What participants say about the Mindfulness Meditation Workshop" at the bottom of this page), we will continue again on a regular basis in 2019! 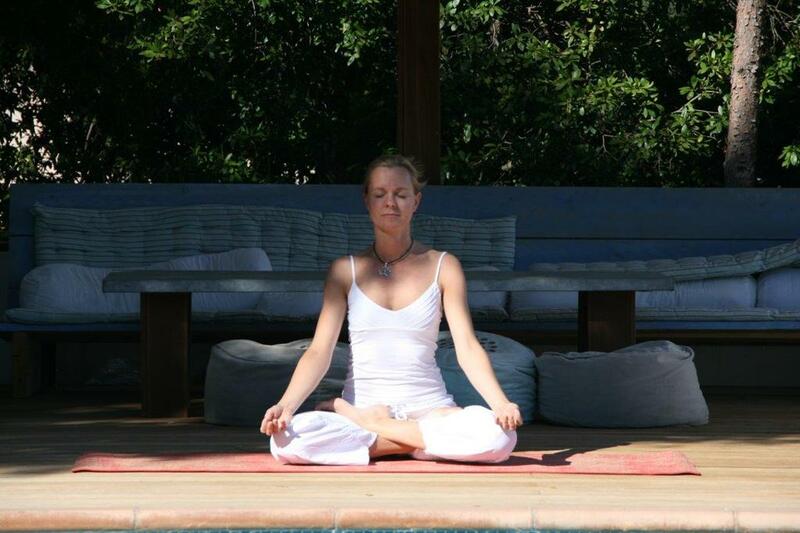 The meditation workshop is for everyone, you do not need to be a yoga / meditation practitioner! So bring your friends / partner too, and discover the health- and life coaching benefits of meditation together! Straight after this basics workshop the Mindfulness Meditation Follow Up Course will start on 8 subsequent Thursday evenings from 19.45 - 21.45hr on Thu 28 Feb & 7, 14, 21, 28 Mar & 4, 11, 18 Apr 2019. We encourage you to also join this follow up course for the most optimal integration and implementation of Mindfulness Meditation into your (daily) life, and to really deepen and develop your meditation practice! “Meditation is about lifestyle. It is a spiritual practice that leads you into the depths of your soul and heart so that you can live from within that zone in every moment. It is about mindfulness: being in the here and now, present to what is in front of you without trying to change it.” ~ Baron Baptiste, Journey Into Power. Mindfulness Meditation is based on Vipassana, which is a Buddhist meditation technique. Vipassana means “seeing the things as they really are” or observing the reality inside, the truth within oneself. The technique is basically to sit or stand still, to step back inside yourself and to observe every-thing that is coming up within you: thoughts, emotions, physical sensations, sensory stimuli, to look at them one by one, from moment to moment - as they are, without being judgemental, without creating more thoughts, without taking action, without getting involved, without analyzing them, without trying to change them; in other words to be in full acceptance of What Is, and from there to let your thoughts, emotions, physical sensations, and sensory stimuli disappear and dissolve, so that you can find inner peace and connect with the stillness of your soul and heart, i.e. your Inner Consciousness, and subsequently start to live from there. “You can free yourself from the mind. This is the only true liberation. You can take the first step right now. Start listening to the voice in your head as often as you can. When you listen to that voice, do not judge, be there as the witnessing presence. When you listen to a thought, you are aware not only of the thought but also of yourself as the witness of the thought. As you listen to the thought, you feel a conscious presence -your deeper self- behind or underneath the thought, as it were. The thought then looses power over you and quickly subsides. When a thought subsides you experience a discontinuity in the mental stream - a gap of “no-mind”. At first the gaps will be short, a few seconds perhaps, but gradually they will become longer. When these gaps occur, you feel a certain peace and stillness inside you. This is the beginning of your natural state of felt oneness with being, the beginning of enlightenment, which is usually obscured with the mind.” ~ Eckhart Tolle, The Power of Now. The meditation technique we teach is especially effective for those people who are looking for ways to reduce stress, worries, anxiety, panic attacks, depression, and emotional distress. For those who have busy professional/private lifes and seek a better work-life balance and are looking for ways to de-stress and relax. For those who seek a better quality of life with more balance and focus. For those who would like to learn how to turn off their busy minds every now and then, to find more peace, clarity and focus in what they do. For people who are overstrained or having a burn-out. For those who suffer from sleeping disorders (like having difficulty falling asleep because of a worried, busy mind), or for those who suffer from pain for instance from headaches or chronic pains and are looking for ways to relieve or cope with the pain. For pregnant ladies who wish to find relaxation during pregnancy, want to use the technique for better being able to cope with the pains and discomforts of labour, and want tools to help them cope with the busy life of being a new mum. Mindfulness Meditation can also help for people who e.g. like to quit smoking or other addictions. The workshops are for ALL LEVELS meditation and yoga practitioners. The workshops will be taught bi-lingual (Dutch / English). Dress in comfortably sitting clothes with warm socks and bring something warm like a light shawl/blanket, to keep you warm during meditation. Also feel free to bring your own meditation cushion if you have one. A small bottle of water will be nice for refreshment, although tea and water will be available at the workshop. Please also bring your own mat if you have one (note if you haven’t got one, we arrange one for you), we will use the mats for sitting. Lastly, you can bring a notebook & pen if you like to make notes during the session. Cancellation policy: no refunds will be granted for cancellations, regardless of reason, unless we can find someone to replace you. In all cases refunds will be processed after the workshop. "The workshop was a great success for me! I was surprised that the meditation went so well, since I didn't expect to pick up the art of meditation that quickly. I have already experienced the benefits from taking part in the meditation workshop as I was much more focused and concentrated the next day at work, even my colleagues noticed this positive change. I will definitively continue the meditation practice at home!" "It was an interesting afternoon. I felt alittle uncomfortable when I entered the workshop, but that feeling quickly disappeared, and after the workshop I felt really good, with a whole lot more energy than usual and a very good mood. You have explained everything very well, it was very easy to follow, everything was very clear and logical. Now meditating at home by myself is indeed a lot more difficult than in a group, but I keep practicing, no hurry. Altogether I am happy with the workshop, I feel it is bringing me something for sure!" "Thank you so much for that wonderful workshop yesterday, it really inspired us and we learned how to do better deal with that crazy ego/mind of us, that can drive you insane if you let it!" "Thank you for the wonderful introduction to Mindfulness Meditation yesterday. I found it very impressive. Also Paul enjoyed it a lot and we look forward to the follow up workshop!" "Understanding who we are behind our thoughts is a big wonder. A wonder might be a good reason to start the journey of discovering ourselves. Corine's mindfulness meditation workshop learns how to find that dimension within ourselves that is deeper than thought." "I really enjoyed your meditation workshop, people and energy! I was really looking for something that, together with Ashtanga yoga and Ayurveda, makes me be more in contact with myself!" "I used to be one of those sceptics. A pragmatic journalist/manager on overdrive, boasting that the only exercise she needed was the daily (and nightly) lifting of two small children. Thinking that yoga was for bores with nothing else to do. That meditation was invented to keep navel-gazers satisfied. My motto: who needs sleep when there's a baby to cuddle? Living on stress hormones, with wine or worse to help me sleep, a burn-out was lurking around the corner. When it eventually and unavoidably struck, that burn-out turned out to be a life saver. Psychiatrists and doctors joined efforts to get me to a gym to lower my heart rate and stress levels. A gym! Trembling and overwhelmed by all the options (did I want to join for a year, six months, two years, use the sauna, take the special offers, want to have a personal trainer, join a spinning workout etc. ), I just wanted one thing: escape. But the gym's assistant, noticing my despair, took a firm decision. Go change, she said, there's an excellent yoga class just starting. I will warn the teacher you'll be joining in a few minutes. Enter Corine Leegwater. I will never forget the experience of that first hatha-yoga class. The overwhelming emotion of the chanting, the overall wellness of trying (flunking but sometimes even managing a few of the) asanas. Needless to say: I became an addict. Started to read about yoga, bought my own mat. Without ever feeling a bore or a navel-gazer, I even let Corine sweep me into a daily practice of mindfulness-meditation. Perhaps it's her own pragmatic approach that struck a chord. In her lovely studio, quietly yet convincing she explained the routines, the underlying philosophy, the history. And during my first attempt at meditation, I entered a world familiar and yet so unfamiliar: the world of Me. Since that day, meditation has become an essential tool on my way back to health. It helps me recognize my emotions and accept myself. Helps me cope with life in gereral. Also, as a sleeping medicine, it's far better than booze... I can never thank Corine enough for showing me the way to become a whole person again." "Thank you for the fantastic experience yesterday. Very instructive, super atmosphere in the group and enough brainfood to be taken with me for quite some time going forward. Highly recommended people!"